Our beautiful, holistic funeral home in the heart of historic downtown Lafayette, Colorado opens March 1, 2019. Meet with our natural funeral staff who will gladly chat about your wishes over a cup of tea in our elegantly renovated facility. We arrange cremation for most of our client families, but we are also experts in natural burial. We are happy to advise on all of your options, and can provide pre-payment policies for those who wish to plan ahead. Come see us and enjoy a complimentary tea during opening hours or call (720) 515-2344. You can also email us at info@thenaturalfuneral.com. A Gift Shop/Resource Center. 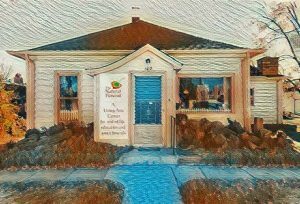 When you enter our center, you’ll walk into our gift shop/resource center where we have complementary tea, a lending library, beeswax candles, natural care products, gift baskets for caregivers and Colorado artisan cremation urns, shrouds and caskets. We’ll also have a wise person on hand to respond to your questions and provide helpful information on our resources whether these are funeral-related or on some other topic like the care of an elder. A Healing Practitioner Room. This is for use by our grief massage therapists and other holistic practitioners who provide support for the bereaved. A Small Group Seminar Room. Here we will host small group seminars, which are not always about end of life. We bring in experts to lead workshops on topics such as how to write your memoirs or create poetry that reflects the stages of your life. Life-affirming topics are as important to us as those that focus on our last days. Family Meeting Room. Where our TNF staff meet with families for funeral planning. Vigil Room/Chapel. This is a sacred space for families to be with their loved-ones after death. Garden Labyrinth. We also envision a labyrinth in our garden area with stones engraved with the names of those we have cared for at death. Our location in downtown Lafayette, Colorado.